Found 4 file extension associations related to Revenant and 4 file formats developed specifically for use with Revenant. 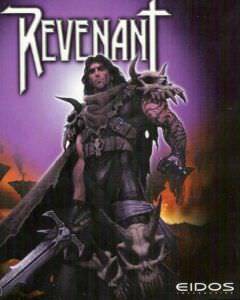 The main character of the story is Locke D'Averam, a revenant named after the house of Averam, which raised him from the dead. His real name is never revealed in the game. Immediately after being brought back from Anserak (Hell), Locke is sent on a quest by his new master, Sardok, who is the advisor to Lord Tendrick, ruler of the island. The quest is to locate and rescue the Tendrick's long-missing daughter, Andria, who was kidnapped by a mysterious cult calling themselves The Children of the Change. The entire game takes place on the island of Ahkuilon, which is home to the town of Misthaven, where Tendrick rules. As the player progresses through the story, it is revealed that Locke was once the king of an ancient empire centered on Ahkulion. This warrior-king made a pact with a demon god, but he found the price of the pact - his beautiful wife's soul - too much to bear and could not go through with her sacrifice. For this reason he was condemned by the demon god to an eternity of suffering in Anserak and his mighty empire was destroyed and pulled into the earth. The cult that the newly resurrected Locke finds himself facing is in fact led by the avatar of the same demon god he betrayed ages ago. As he explores Ahkuilon in pursuit of the missing Andria, Locke finds himself facing enemies both new and ancient. Many characters in the game hint that there is a "darkness" surrounding Locke and some even seem to know of his past. As the story builds to a climax it becomes clear that not all is as it seems and that history may yet repeat itself. If you need more information please contact the developers of Revenant (Eidos Interactive Ltd.), or check out their product website.